Are you a part of another group? NO – We are separate and apart from the other animal welfare organizations on-island – but often times we work closely with them – performing their spay neuter surgeries when required and liaising with them when we encounter animals that are to be surrendered. Do I have to pay for the surgery? NO – SNiP offers these surgeries completely FREE of charge to any animal owner who contacts us, no questions asked. We do not have an income qualification process. Obviously any donation that someone wants to make is gratefully accepted and allows us to offer our services to other animals. How do I book an appointment for an animal? Contact SNiP via phone at 247-1412, messenger on Facebook or via email: [email protected] A volunteer will speak with you to schedule that animal’s surgery. SNiP appointment slots at our veterinary partner are available weekly based upon their schedule. The SNiP volunteer will work with you and your specific situation to get an appointment that works for everyone. 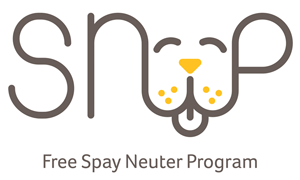 SNiP also holds a monthly Spay Day – a full day, every month dedicated solely to FREE spay neuter. Between the weekly appointments and our monthly Spay Day, most animals have a maximum wait time of 1 to 2 weeks (obviously situations vary based upon animals age & health). I see some cats hanging out and they have clipped ears. What does this mean? The left ear is surgically clipped at the time of spay neuter surgery for stray or outdoor cats as the well-known signal that that particular animal has been sterilized. My male dog keeps getting into fights with other males. How come? Intact male dogs whom have not been neutered often get into fights with other males, over female dogs. Sterilizing your male dog means that he won’t be chasing the female dogs in heat and the likelihood of him fighting other males will go down significantly. My male dogs keep running away from home. How come? Intact males will do just about anything to find a female to mate with. That includes digging his way from under the fence or making like Houdini to escape the house. Once he is free to roam, he risks injury in traffic and fights with other male dogs. Neutered male dogs tend to stick around and protect their homes better. Intact males are out looking for mates and therefore do not fulfill their role as protectors of their homes. What does sterilizing my animal do for the community? Unsterilized animals breed and produce more animals many of which become stray / free-roaming. Stray & free-roaming animals pose a real problem in the country. They can prey on wildlife or even pet animals, cause car accidents, pack up and chase children or tourists on the beach. By sterilizing your animal you are ensuring that your animal does not contribute to our animal overpopulation problem in TCI. What if I can’t handle my animal? Contact SNiP to discuss your specific circumstances – we have both dog & cat traps that can be used to get the animal in for surgery. What if I don’t have a car and can’t get my animal in? As our services are provided free of charge we do ask Owners to participate in the process. SNiP keeps our costs low by utilizing unpaid volunteers and their vehicles – we do not have a vehicle that we pick up animals in. However, volunteers are willing to help do pickups based upon availability – but that likely means that your animal will have to wait longer to get in. What if its not really my animal – but one that wanders into my yard and has made my yard it’s home? SNiP offers the surgeries completely free of charge for just this reason – you may feed and care for the animal, but it’s not really yours and you don’t want to pay $200 or more to sterilize it. You don’t mind it hanging around and will feed it, but don’t want it multiplying. Contact SNiP to discuss the specific circumstances and we very likely can help you. What happens day of surgery? Your animal should not have breakfast the day of surgery. You will bring your animal to the clinic at the time advised by the SNiP volunteer. You will sign a Surgical Consent form (available in English & Creole) and your animal will be admitted to the clinic. Your animal is given a brief physical evaluation by the Veterinary team to ensure it seems healthy enough for surgery – however NO pre surgical bloodwork is done. Your animal is sedated and sterilization surgery performed – for females that means that her ovaries & uterus are removed, for males their testicles are removed. All animals are given a green tattoo on their abdomen to indicate that they have been sterilized. Animals are monitored during recovery and when sufficiently recovered are sent home with Discharge Instructions and pain medicines. If the animal is an outdoor animal with no safe place to recover, we will keep the animal overnight at the clinic so they can safely recover indoors without being bothered by weather or other animals. What is the right age to sterilize my animal? Females go into heat (can get pregnant) as early as 6 months of age. To prevent an unplanned pregnancy we recommend spaying your female by 6 months of age. Males can mate and reproduce as early as 6 months of age. To prevent them wandering we recommend neutering your male by 6 months of age. Animals can be sterilized as young as 8 weeks of age, as long as they weigh 2 lbs or more. All animals need to be healthy to undergo surgery. Transmittable Venereal Tumor is a cancerous tumor spread mainly through sexual contact with an infected animal. The only way to cure it, is to do chemotherapy treatments every week for 8 – 10 weeks which can be expensive. The best way to try to prevent your animal getting TVT is by spaying or neutering them, reducing their desire to mate and potentially come into contact with the virus. I want to make a donation in honor of someone’s birthday. How do I do that? Thank you for thinking of us! If you wish to make a donation in memory of someone’s pet, in honor of someone’s birthday or some other special event or occasion, please send us an email to [email protected] with details of the special event or occasion along with the contact details of the person(s). Once your donation is made, we will contact the person and let them know that a donation has been made in their honor. We will send them a graphic card via email and will copy you on the correspondence. In order to keep our costs as low as possible, SNiP is provided all the medicines at cost. SNiP has made the concerted effort to keep costs low – we do not have business cards nor a vehicle for animal pickups – we utilize our volunteers vehicles. Of course, if someone wants to donate a vehicle – we would be very happy to receive one!